What can be better than old good Jenga? Of course, it’s a jumbo version! But as with everything in our life, we face with a choice and in the majority of cases, it is quite difficult. So, how to choose the best “giant” which will bring unique emotions to you and your family? We are going to puzzle out this issue in our article. Our team collected eight best options of this world-famous game and is ready to present them to our readers reviewing all their pros and cons. So, meet eight best Giants we have found! If you are searching for the high tower which you can create both indoors and outdoors – here it is. 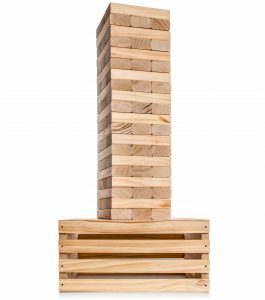 The ideally smooth wooden bars of this giant allows you to create a real skyscraper of five feet in height. The start of this game is on the 2.5 feet level and then rise with your proficiency. The more dexterous players can reach the highest scopes when reaching the maximal height. This game is desirable for everyone whose age is eight years and up. It has very simple rules so you shouldn’t worry that you may misunderstand something. Everyone regardless of an age and profession will definitely get lots of positive emotions and thrilling moments when pulling out the last brick. This option comes with a durable case for convenient transportation; Isn’t recommended for children whose age is less than eight years. If you want to spend more time with your closest ones and get lots of fun – this is an excellent option to choose. Good quality of blocks, five feet of height, and simple transportation are among the main reasons to consider this game when choosing the best “giant” for your family or friends. 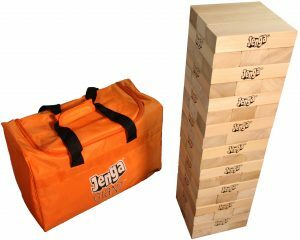 For the more experienced players who feel that five feet are not enough, we have this variety of Jenga. Consisting of eighteen rows, it can reach the five feet marking and even higher! Impressive, yes? The one more feature that this option can boast of is its blocks. According to the manufacturer, each of the bars of this game was made from the top-notch pine and is ideally polished. You shouldn’t worry about possible injuries while playing because of the bar’s splintering. The second option in our list is recommended for everyone who wants to get the highest quality product and set the new records. In addition to this, it comes with a special board where you can write new rules and make the game process more complicated and fun. The opportunity to set and write down your rules on the special board; The light color of the case may become dirty comparably fast. This game will become an ideal choice for those who are aimed at the excellent quality and want to add some creativity to the gaming process. 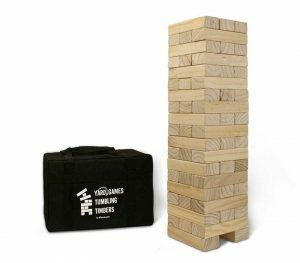 In the wide number of variations of the authentic Jenga, it’s not a simple task to choose the high-quality and genuine one. But we did it. The third position in our list is occupied by the giant version of the original game. The height of this option can reach the position of five feet and even higher – everything depends only on your skills and dexterity. As well as the first game created in the far 1970s, this option also consists of fifty-four perfectly smooth wooden blocks. The only one difference in its size which exceeds the classic version for more than fifteen times. Bright and heavy-duty case for carrying; Is too large to play indoors. This is a good choice for playing outdoors with the company of friends or in a family circle. The top-notch quality of the bars and the height of more than five feet make this option worth your attention. Family BBQs, hangouts with friends, various corporate parties, and many more events can be full of fun and positive emotions in combination with a light spirit of rivalry and thrilling moments. How do this everything can be collected together? Of course, with Jenga. 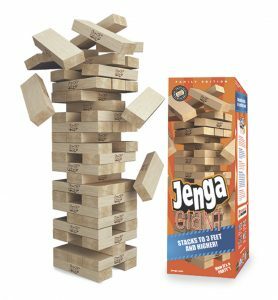 The jumbo version of the classic Jenga game which has conquered hearts of the millions of people all over the world can make each event awesome and unforgettable. The version which occupies the fourth place in our list is made of the hardwood. It consists of the fifty-four bricks as well as the classic version and can reach the height of four feet. Moreover, you can purchase an additional “booster pack” and increase the size of your skyscraper for more than five feet. Absolutely similar to the classic version but eight times bigger. Age limit – eight years. The option can become a good choice for beginners as you can purchase the booster pack and complicate the game. The high quality of the polished bars prevents possible scratches while playing. We all know how cool the giant Jenga versions are. Even if all of them differ by their features, there is one thing that unites all of them. This is the main drawback of all wooden “giants” – their weight. Sometimes even with the availability of the special bag for carrying the game, it is not convenient to take it with you and you are limited with your backyard area. The game on the fifth place of our comparison chart can boast of the best carrying bag ever available. Durable, double-zippered bag with the double stitched handles will help take your favorite game wherever you want without any efforts. You can also store your game in it when not in use in order to prevent wood spoiling with the process of time. Fifty-four smooth wooden bricks with the maximally reduced friction will make the game full of the competitive spirit. The height of this tower can reach more than four feet but you should do your best to get the highest score. Fifty-four blocks as in the classic version. Not the highest version available nowadays. If you want to try your dexterity and other secret skills you use to win, this option will become a very good choice. It has a good quality of bricks and can be carried wherever you want without any significant efforts. Most probably when you read the title of the sixth option you think that we have made a mistake. But no, this game really doesn’t have any bag for carrying. How is it possible? 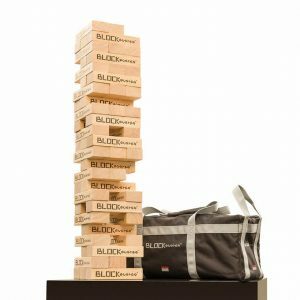 This version of the good old Jenga has a unique storage crate that can also serve as a table for gaming. This will save you from the permanent necessity to search for the flat surface when playing Jenga outdoors. Also, it will not tear with the process of time as the usual bags do. There is one more feature that differs this option from all others – the weight of its blocks. 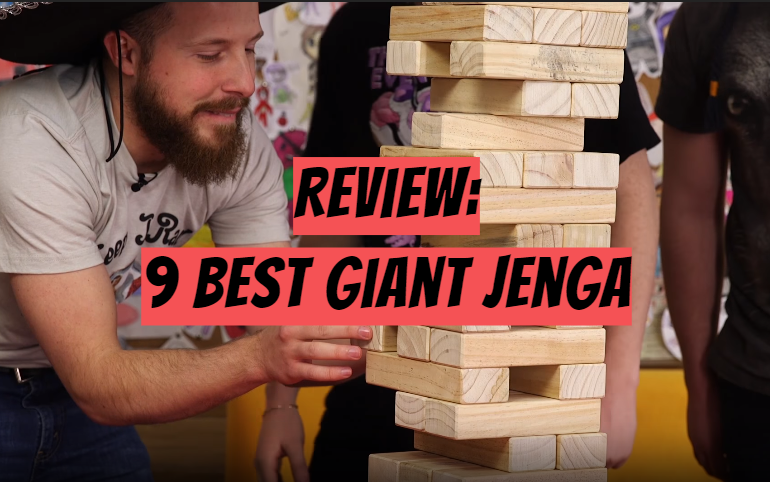 We have already mentioned above that all the giant Jenga games are comparably heavy. This one is an exception. With the weight of only twenty-five lb. and height of five feet it is ahead of other options. Together with the high quality of the bricks, the features mentioned above make this version definitely worth your attention. Comes with a wooden crate for storage; Is more expensive than similar options. So, for whom is this option recommended? According to the manufacturer, everyone from the 0 months and up can play this game. With the lifetime warranty and durable crate for storage in combination with the lightweight, it will become an excellent purchase for all types of events. Yes, among giants there are also the highest and the smallest ones. The option which occupies the seventh position in our list refers to the tiniest giants and is a great choice for kids. 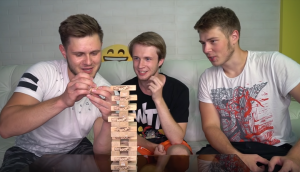 The height of this building is three feet so even if you have never played such games, with this one, lots of fun and success is guaranteed. 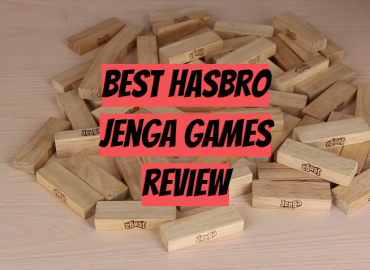 Each of the fifty-four wooden bricks of this game is well polished and precision crafted. Kids will not get an injury because of splintering the wood as it can be with the poor quality options. The weight of this game is less than eleven pounds but you can be sure that it will cause a lot of noise when falling! Kids will definitely like the gaming process regardless of have they won or lost. Nevertheless, you shouldn’t think that this version of the classic game is designed only for children, adults will also enjoy the gaming process especially in a family circle. Good choice for kids. Should be stored and transported in a box, not in the bag. This well-made and the comparably simple game will become a favorite among kids of six to nine years. 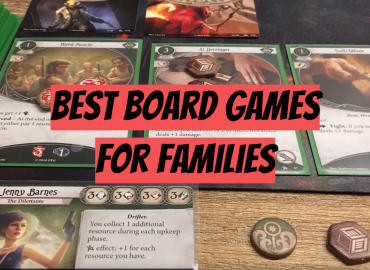 It is a good choice for playing in a family circle. As well as the previously mentioned option, this game variation refers to the small giants. This game is intended for people who want to spend the priceless time with the family trying to build a real giant and set the new records. The recommended age for the option is from six to nine years, so it will be an excellent choice for kids. The maximal height of the tower can reach three feet while the sound of a big crash will make the kids excited about the gaming process regardless of the result. This option is similar to the original version of the game but is six times larger. Each of the fifty-two bricks is ideally polished and slips well during the game. The weight of this version is less than eleven pounds, so it will not cause any problems to carry the game to the yard or wherever you want to play. Well-polished blocks from the high-quality wood. Minimal recommended age is six years. 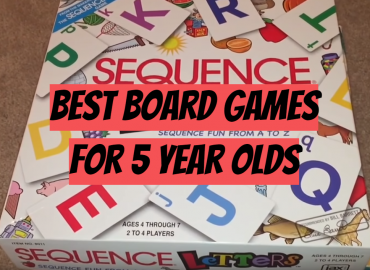 If you are searching a game to spend time with your kids and get lots of fun – here it is. Simple enough to interest the “small builder”, this option will bring many exciting moments and joy of setting the new records. To hurry or maybe it’s better to be more careful? Choose this block or maybe that one? You will never know the right answer to these questions until you try. That is the essence of Jenga. No special rules that always work, no secrets and super abilities. Try, learn from your mistakes, and start again. Each time when you do everything from the very beginning, your tower will be higher and higher. The last option in our list allows you to build the real Burj Khalifa at your backyard the height of which is more than five feet. The game also comes with a dice to complicate the rules and make the gaming process more thrilling for each player. You can create your own rules or find possible variations on the Internet, it’s absolutely up to your preferences. As well as each option presented in our list, this game has high-quality blocks, each of that is smooth and pleasant to touch. The bricks of this game are made of the pine and have smooth edges. 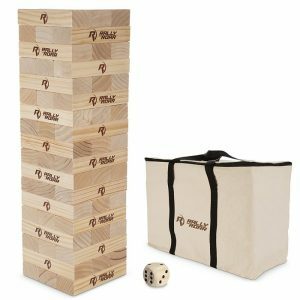 In addition to this, the option comes with a durable bag for easy carrying or storage the game. 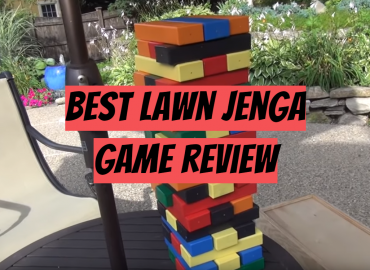 You can take it to any event that you want to turn into a funny tournament or just to make your own party in the backyard with friends or family. The smooth surface of the bricks; Makes a lot of noise if play inside. It doesn’t matter whether you purchase the game for you and your friends or for kids – this option is a good choice. It is interesting enough for adults and at the same time simple enough for kids. High-quality bricks made of pine will make a great “kaboom” when the construction falls. 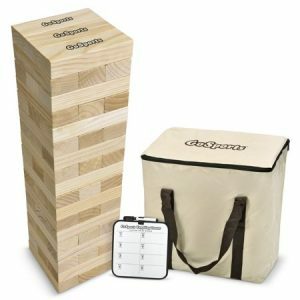 Good choice for all the Jenga lovers. So, summing up all mentioned above, we are close to answering the main question – which giant Jenga to choose? First of all, try to choose the high-quality options with the well-polished bricks, otherwise, you risk getting injuries while playing. Also, you should decide how high you want your tower to be. To date, you can choose the smallest versions such as three-feet options or purchase the real giants of five feet and more. If you want to get the version which is maximally close to the classic one – choose the game with fifty-four bricks. At the same time, if you want to complicate the process and add your own rules, you can choose among version with dices. 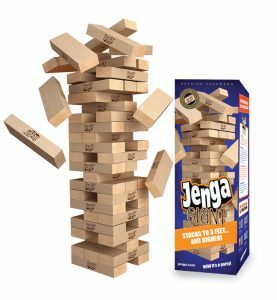 Actually, it doesn’t matter what are the dimensions of your Jenga is and how complicated will be its rules – with the good company you can get the unforgettable positive emotions playing it. All the modern giant versions come with durable bags for carrying, so you can take it wherever you decide to go and enjoy the gaming with the closest ones. The classic never gets old. 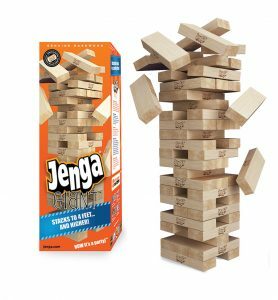 This refers to the Jenga which was created in a far 1970 and remains extremely popular nowadays. Being created as for game for one family, it has conquered hearts of millions of people worldwide.